Here’s the brief. It’s a glorious spring day in Paris. Too beautiful to be indoors. You’ve shopped, you’ve eaten, you’ve wandered … Its time to feed the mind but your appetite for culture is tempered by the all too perfect weather. Maybe you have a child in tow who needs a romp. And you want to avoid the crowds. So where should you go? No Crowds favourite Paris destination for moments like this is the garden of the Rodin Museum on rue de Varenne in the 7th Arrondisement. In 1908, the writer Rainer Maria Rilke had this to say about the garden in a letter to Rodin. “You should, dear great friend, see this beautiful building and the room I live in … Its three bay windows fantastically overlook an abandoned garden, where from time to time one sees little rabbits jumping over the trellises, like something out of an old tapestry…” Rodin became so smitten with the place that he ended up renting rooms on the ground floor, coming nearly every day to meet with models and clients. By inhabiting the Hotel Biron until his death and with the donation of his works, his archives, and his collection, the establishment of a Rodin museum was secured. In 2009, you could hardly call the garden of the Rodin Museum abandoned but it’s certainly not crowded. A visit to the atmospheric garden allows you to stroll around, eat an ice cream, contemplate some of the greatest masterpieces in the history of art and avoid the throngs who instinctively head indoors to see the collection. All for price of a euro which is what it costs for garden only access. And guess what? On a glorious day, its perfectly OK to skip the hot and crowded, although lovely, Hotel Biron because as a master of monumental sculpture, Rodin’s greatest works such as the Thinker, the Gates of Hell and the Burghers of Calais are all outside anyway. Use the money you saved on the entry ticket to rent an audio guide for a fantastic half hour or so of narrative and anecdotes on the life and work of this passionate artist all enjoyed au plein air. Unfortunately, the museum does not have a separate line or entrance just for the gardens and the wait to purchase your ticket can take 15 to 20 minutes, although last Sunday, we waited for only five. Holders of the Paris Museum Pass, which we highly recommend, get in free and go straight to the head of the line, as you do at roughly 60 other museums in Paris. Sometimes, carving out a piece of a great experience is the best way to enjoy it. 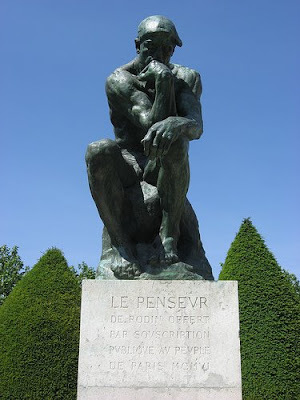 On a perfect day in Paris, perhaps the best way to enjoy Rodin is to skip his museum and go straight for the garden.